We have briefly touched upon the location. On Nut lies in a key intersection on Sukhumvit Soi 77 to Suvarnabhumi Airport. Furthermore, it is conveniently located next to the IS 50 for access to the expressway. From here, you can easily travel around the city and further afield. Whilst property prices around Bangkok continue to rise, On Nut prices remain affordable – for now. If you look at prices in Thong Lo, for example, average prices range between 200,000 to 300,000 THB. 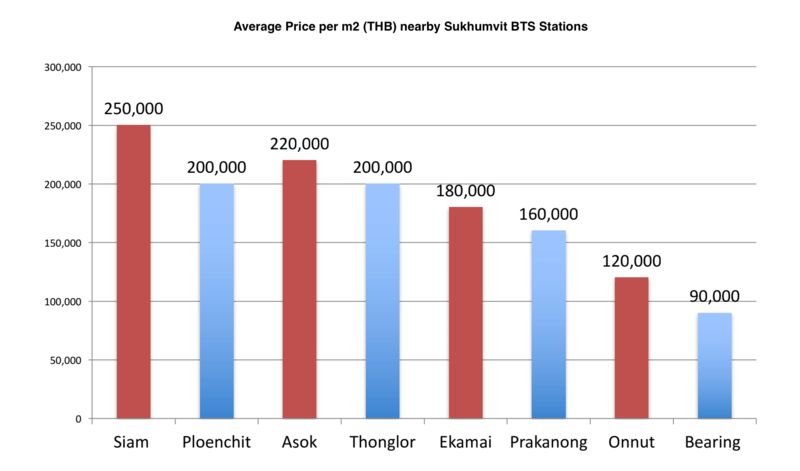 In comparison, you can still find property prices in On Nut for between 120,000 to 150,000 THB per m2. This is a huge difference and means that you can currently get far more for your money. On Nut provides a host of affordable properties, but there is also a selection of developments aimed at the high end of the market. If you are commuting, or need to travel regularly within Bangkok, On Nut is ideally located. We mentioned the location above, but what about the actual transportation? First, we have the Sukhumvit BTS line – the On Nut BTS station can be found at the western end of the area – this provides access to Thong Lo, Asoke, Sathorn, Siam and other important areas within the capital. Aside from the BTS, On Nut also has a superb network of taxis and motorbike taxis. You can easily travel around the area very affordably and conveniently. For any area to be popular it needs amenities – shopping malls, schools, cinemas etc. Things that will keep people entertained in their spare time. 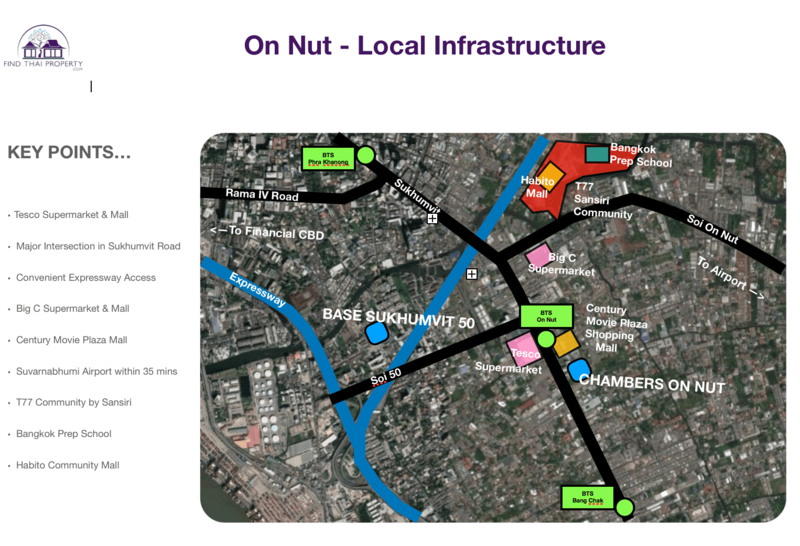 On Nut delivers a myriad of fantastic amenities shown and listed on the map below. These amenities are just a handful of the larger developments. Throughout On Nut, there are countless more shopping outlets, retailers and public areas. It really is a thriving area. On Nut is an area that is widely becoming known for its food and culture. You can find street food vendors throughout the area. There is literally something for everyone’s taste and budget – from cheap and cheerful street vendors selling duck noodles and Khao mun gai, to fine dining experiences in restaurants that offer views along Sukhumvit Road. Examples of popular restaurants in On Nut include Azuma Tonkatsu, Cabana Garden Restaurant, Roots and Best Beef. Best Beef is a busy restaurant that is known for its quality, excellent service and tasty meat. Azuma Tonkatsu, on the other hand, is cheap and cheerful and provides a range of tasty eggs bowls and noodles. One important aspect of the rise of On Nut is the T77 development. This project is fronted by the Sansiri company and has had a major impact. Located in the western part of On Nut, T77 has radically changed the landscape. 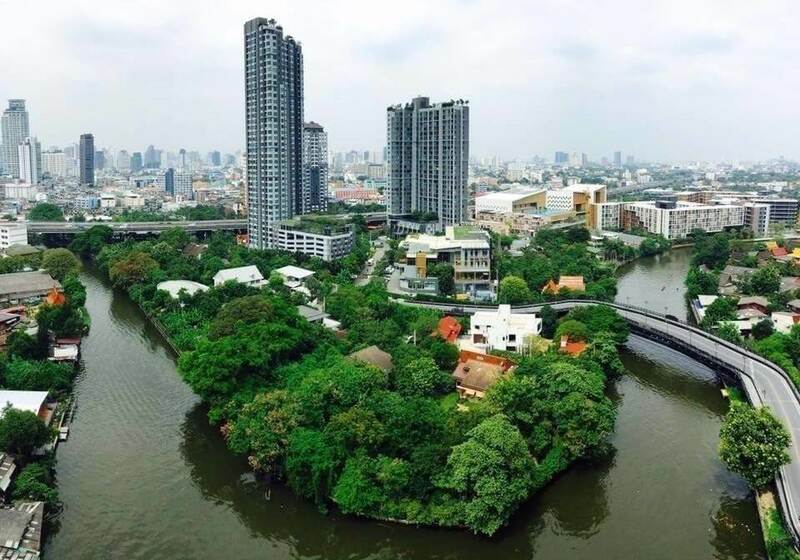 This development contains 6 residential properties including The Base Sukhumvit 77, Hasu Haus and Garden Square. It has done wonders for the area and helped boost its popularity as a prime residential area. The graph below shows the Base Sukhumvit 77 asking price trend since its completion in 2014. As time progresses we should only see the popularity of On Nut increase on a wider scale. The BTS line expansion continues which opens up new surrounding areas. Furthermore, developments such as T77 provide residential accommodation for expats, families and business types. In addition to this, the reasonable property prices and sustainable infrastructure really do make it an attractive investment proposition right now.